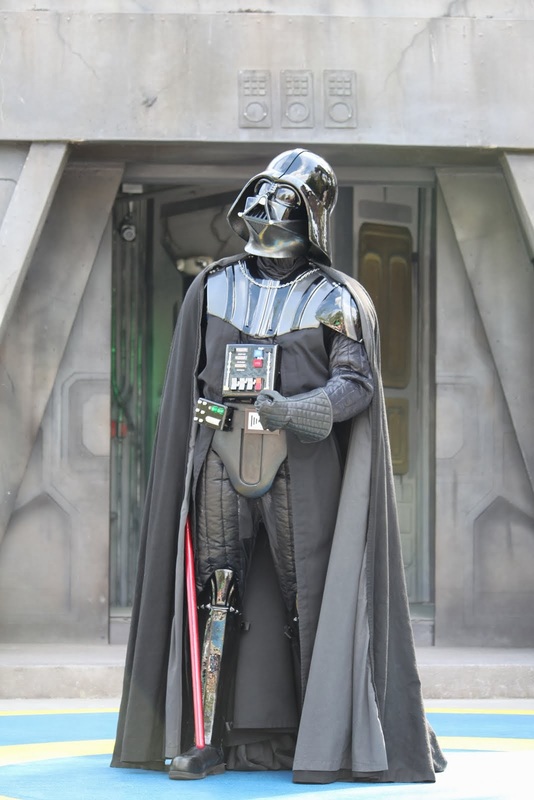 Nearly three years after the announcement of Disney's acquisition of Lucasfilm, it was confirmed at this weekend's D23 convention that both Disneyland and Walt Disney World will be embarking on expansions to introduce a greater Star Wars presence in their parks. In short, Star Wars Land is coming to both coasts. The expansion will the largest in Walt Disney World's history, with Disney announcing that the new land will span fourteen acres. Very little has been announced in terms of specifics, but what has been shared is definitely cause for excitement. 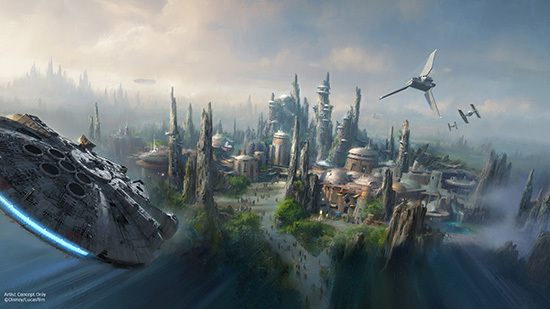 While there has been much speculation as to which of Star Wars many worlds would make a suitable setting for a new themed land, Disney threw a curveball at fans by deciding to abandon them all and create a new world in which to immerse guests for this Star Wars experience. What has been shared thus far is that the world will be part of the "outer rim" territories, on the boundaries of "wild space," all of which means we can expect it to feature a spaceport, much like Mos Eisley on Tatooine. Plans for a cantina are also in the works. In the concept art that has been released (a mere few drawings,) the planet's architecture and topography look as though it is a melding of familiar elements from Padme Amidala's native Naboo, the Republic capital of Coruscant, and Kashyyyk, home of the Wookies. Disney executive Scott Trowbridge, who has been assigned exclusively to "Star Wars" projects, indicated Saturday at D23 that the new land will be totally immersive and allow guests to experience the characters, setting, and stories of Star Wars like never before. 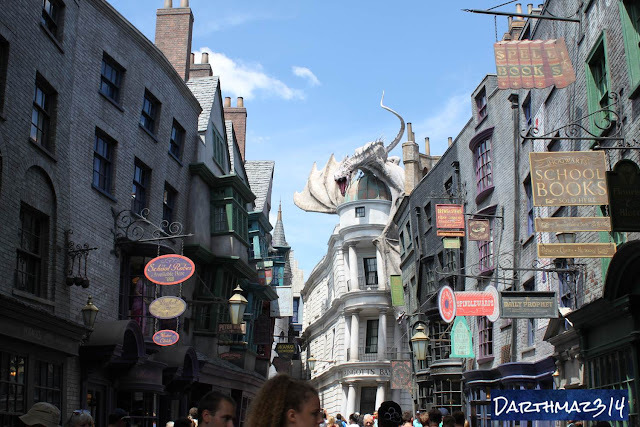 The announcement of immersive theming is not a surprise, since this strategy has been immensively successful at Universal Studios' Wizarding World of Harry Potter and and is a main reason that the attraction is a phenomenal experience that truly transports guests to the magical world of the popular book and film series. From what Disney has revealed thus far, there will be an attraction that allows guests to pilot the Millenium Falcon in a customizable experience that places them squarely in the midst of a battle between the First Order (the new antagonists of The Force Awakens) and the Resistance (the new twist on the Rebellion of the original trilogy.) 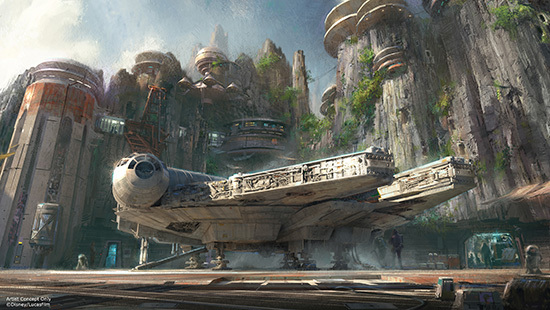 The concept art depicts the Falcon actually docked in the land itself. If they in fact build a scale version of the classic Correllian freighter, the land will definitely have its park icon and it is almost impossible to imagine how many photos of that thing will be taken in the coming years. Taking a cue from the Wizarding World of Harry Potter's Diagon Ally, it appears that Star Wars Land will feature tall building structures and what look like some type of naturally occurring organic towers, which are possible supposed to be treelike or made of rock. This tall backdrop, which will most likely also house additional attractions and merchandise locations, will prohibit guests' visibility beyond the land itself, which will foster a feeling of true immersion in the theming. Again, very little has been announced in terms of specifics and even less about time frame for a debut of this much anticipated land. 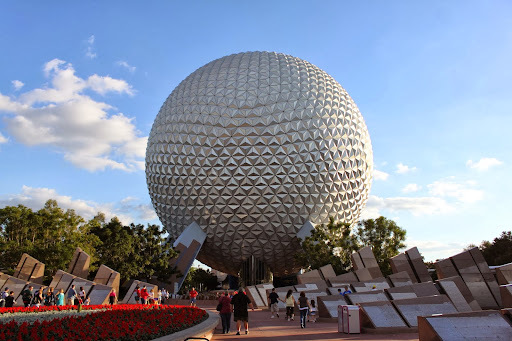 It will most likely take years to create this land, especially considering the attention to detail and painstaking process that Disney applies to all of its park construction projects. However, the overwhelming response to the Wizarding World of Harry Potter at Universal and the fact that it has fueled Disney's rival in Orlando to capture a frightening (yet still modest in comparison) percentage of the theme park market share in the last few years, will undoubtedly force the Mouse to compress his construction schedule. Disney also has plans for some more immediate Star Wars experiences to whet the appetite of the rabid fan, which will debut in the near future. More about these in future posts. For now, rest in the knowledge that the premier entertainment company on Earth owns the Star Wars property and has confirmed that they are building their largest in-park expansion ever, which will debut in the midst of a pack of new Star Wars films. Finally, it is really happening.